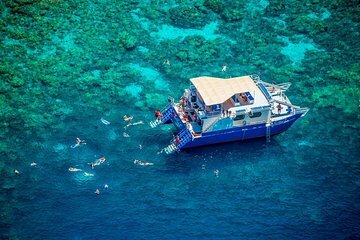 Kuier terloops door de kustlijn van Kona en snorkel met het tropische leven in de zee, terwijl je in de wateren van Kealakekua Bay aan het plonzen bent tijdens deze luxe Kona snorkelcruise. Snorkeluitrusting wordt aan boord verstrekt en professionele instructie maakt deze Big Island snorkelcruise tot een leuk familie-avontuur. Op de cruise tussen de kust en de snorkellocatie, houd je ogen open voor spinnerdolfijnen, schildpadden of zelfs mantaroggen en geniet je van uitzichten op vulkanische formaties langs de kust van Kona. Deze Kona snorkelcruise vertrekt vanuit Keauhou aan de zuidelijke rand van de stad, wat zorgt voor een korte en comfortabele cruise naar de baai van Kealakekua. Begin de tour met een dampende kop Kona-koffie, die rechtstreeks afkomstig is van de boerderij van de Dant familie en wordt geserveerd met muffins en fruit. Wanneer u aankomt in de beschutte baai van Kealakekua, zijn de volgende 2,5 uur gereserveerd voor zwemmen, snorkelen en spetteren met het leven in zee. Maak een bocht van de waterglijbaan van 15 voet (4,5 meter) of het hoogspringenplatform vanaf het schip of volg scholen kleurrijke vissen terwijl ze over het rif fladderen en rondvliegen. Terwijl u geniet van het heldere water of luiert op het dek, stookt de kapitein de barbecue op voor een lunch met hamburgers op zee. Er zijn ook tuinburgers en vegetarische opties voor uw maaltijd met uitzicht op de oceaan, evenals een brede selectie dranken die u aan boord kunt kopen. I loved this trip. With all the rocky shores on the Big Island, this trip gave me my snorkeling fix. You snorkel right next to Caption Cook's Monument (i think that is what it was called). Great lunch and snorkeling. We saw a couple little sharks in a crevice too and spinner dolphins. Our boat caught several fish while we were going to the snorkeling spot, it was very entertaining. I would definitely recommend this snorkel cruise. This cruise was beyond fabulous. Very relaxing to and from our snorkeling destination. Great food. Attentive and knowledgeable staff. LOTS of time to enjoy snorkeling, with all gear provided. Optional SNUBA available, which I took advantage of and absolutely LOVED. Also saw some frolicking whales in the distance! Maybe I'll do it again before I go home! We had a large group for breakfast and lunch but didn't feel crowded. They had equipment for everybody from 80 to 3. Flotation boards with windows , view cubes, tubes even scubalike equipment. Food was good and crew did everything for you. Slides and high dive for the young and young at heart. Great day snorkeling with no sand in your suit or in your car.Fresh water showers on the steps was a nice touch. Movie on deck on sea life and Adult beverages available for the ride home, fun was had by all. Most Important:: The Staff was very safety conscious from start to finish while also being friendly and informative. Food was great. Everyone had a great time. It was just the right amount of time so no one got too tired. This snorkeling trip was terrific! The staff was very professional and the outing was very well run. It was a little crowded at the marine sanctuary, but still plenty of room to explore. Crew was excellent and made for a fun cruise and snorkel. There were not as many fish as we hoped for in the Captain Cook area. No complaints at all about the boat or the crew. Most interesting part was the marine wildlife video and talk on the way back in. My wife and I had a great time snorkeling. The Kealakekua Bay was beautiful, lots of fish, a few turtles and on our way over, a pod of dolphins took turns racing in the wake of the boat. One regret I have is that I didn't wear a water shirt. I spent so much time snorkeling, my back was very red when I got back. What a fabulous day. The water was crystal clear and plenty of fish and coral to see. The crew and captain was great and shared many interesting facts. See Captain cook monument and the bay was great. My kids and husband loved the jumping off the boat and the food was fabulous. Was just the right time on the boat and in the water. BEST snorkeling tour we have ever been on, and we've been on many! The boat was the perfect size, and we all loved the slides and diving platform. Kealakekua Bay is the most gorgeous spot I've ever seen to snorkel. Perfect visibility, and I could not believe the amount and variety of sea life we could see! Most of the area is nice and shallow, with little to no waves or current. Perfect for floating face down for long amounts of time looking at fish. There were several other smaller tour boats in the bay when we arrived, but it did not feel crowded in the nice large bay. Those boats were gone after awhile. Nice, knowledgeable guides, decent food and drinks, with a cash bar open on the way back. We even ran into a pod of spinner dolphins on our return. I would recommend this cruise 100!